The Cornerstone Gallery: More sales at Cornerstone - Bonnie this time! 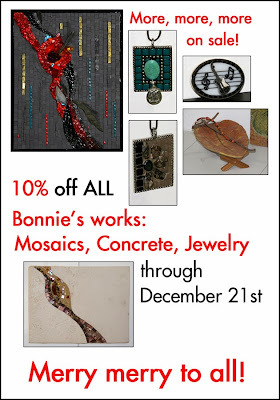 More sales at Cornerstone - Bonnie this time! What cool things does Bonnie have in Cornerstone Gallery??? How about belt buckles? This photograph with the guitar is a belt buckle ... and there are straps available, too. Perfect for the musician or music lover in the family. There are mosaic pendants, concrete leaf castings and mosaic fine art panels. 10% off now through December 21st! Visit the art exhibits while you are in Bower Center.